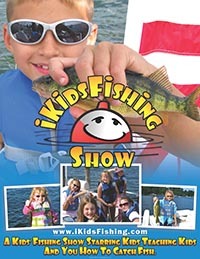 The iKidsFishing is a Kids’ Fishing video Starring Kids Teaching Kids and You How to Catch Fish. Using inexpensive Poles & Reels while fishing from docks, lakes, harbors, public access areas and state parks, a 16 ft. fishing boat or a pontoon boat. Using bait found cheaply and locally as well as some effective artificial baits. It’s a Kid’s thing and one that a Family can afford to do All together if they wanted too.